It finally got cool enough for Mr. Dragon and yours truly to make a quick trip to the zoo to see the dinosaurs. 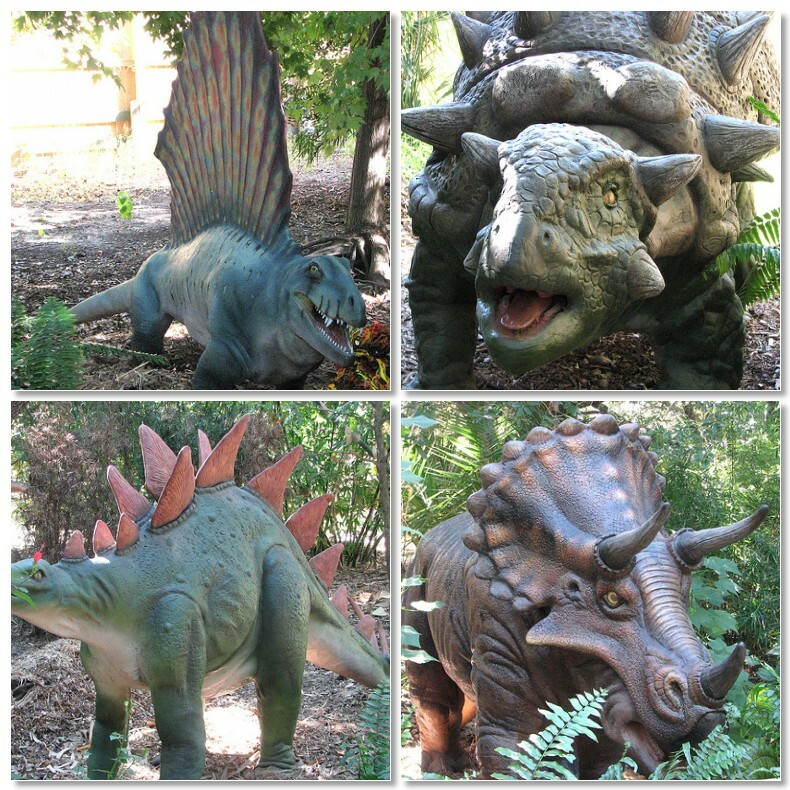 Bring the dinosaurs to the zoo during the summer when folks are looking for something to do with the kids. will enjoy the dinosaurs and find out that the Houston Zoo is a great place to visit. It was such a good idea, that the dinosaurs were held over through Halloween. for the dinosaurs to play in. It was all well thought out. We had a great time watching the kids. and suddenly, when they come on the first dinosaur ... quiet! BIG critters and they make LOUD noise. 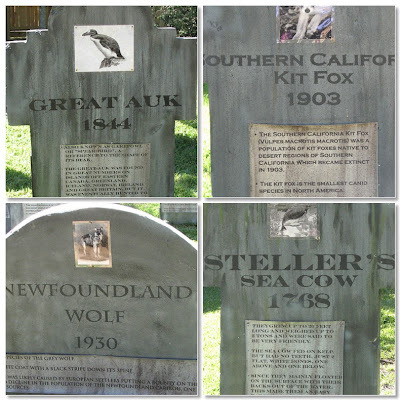 At the every end there was a cemetery. on land and in the seas. 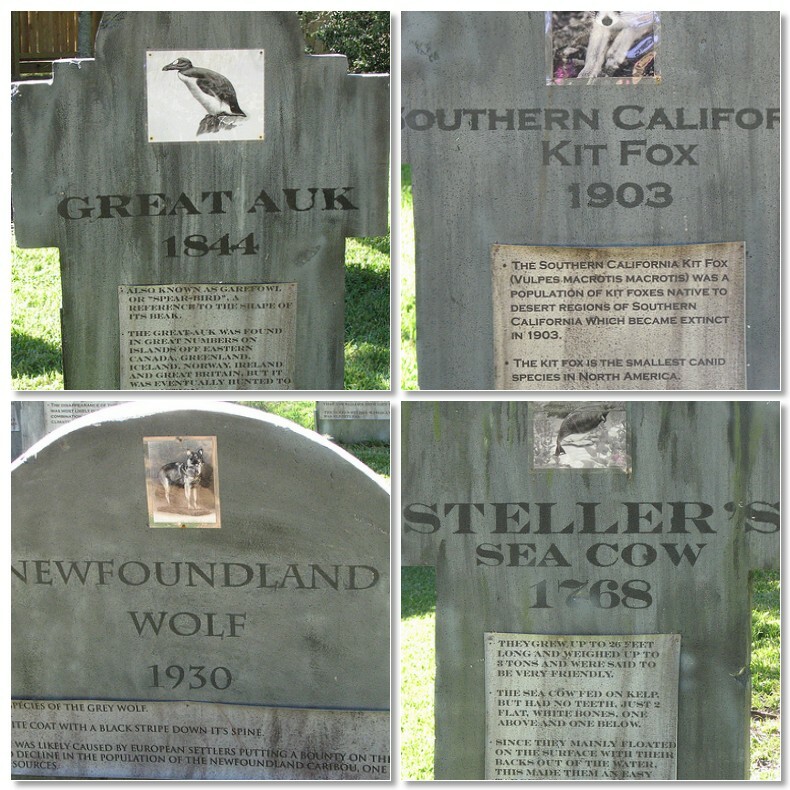 We really don't have a very good record being stewards of the earth and its creatures. It was a lovely, cool (mid 70's instead of low 90's) way to spend the afternoon. 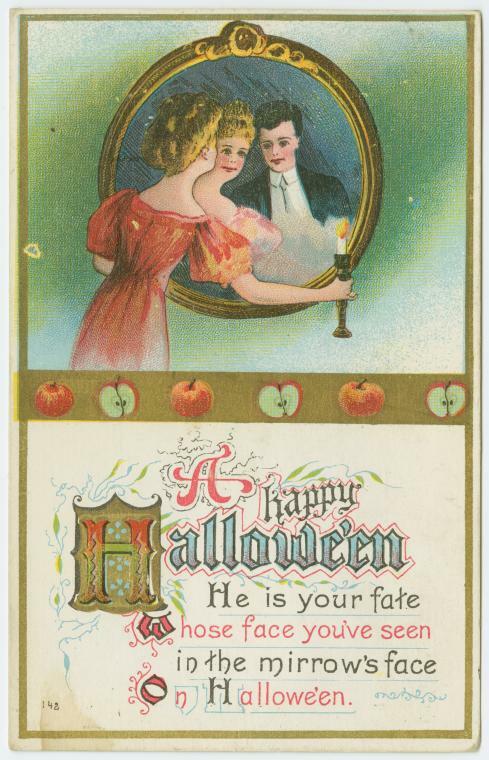 One more Halloween postcard from the New York Public Library digital collection. 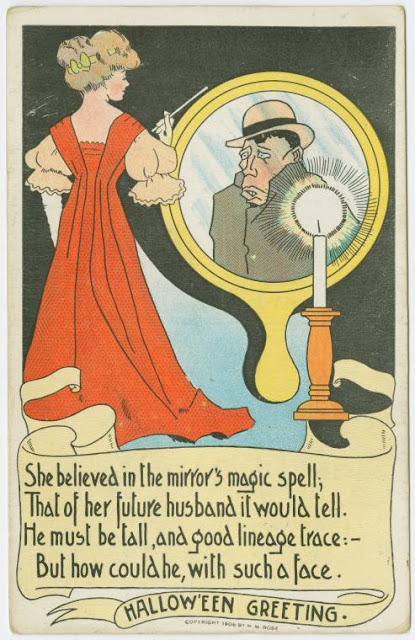 Let's see what she sees in the mirror this time! 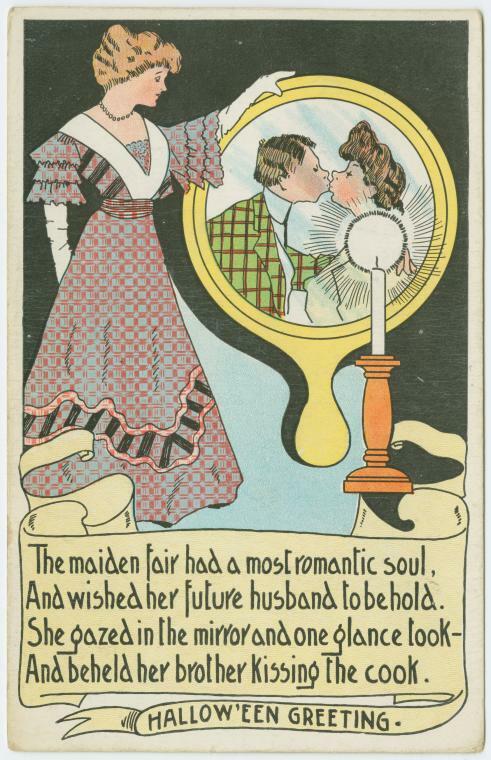 And wished her future husband to behold. And beheld her brother kissing the cook. Don't forget to visit the lovely Beth, who hosts Postcard Friendship Friday. You'll see a variety of postcards there. Wishing you well, a JOY filled weekend, and a spooky, treat filled HALLOWEEN! 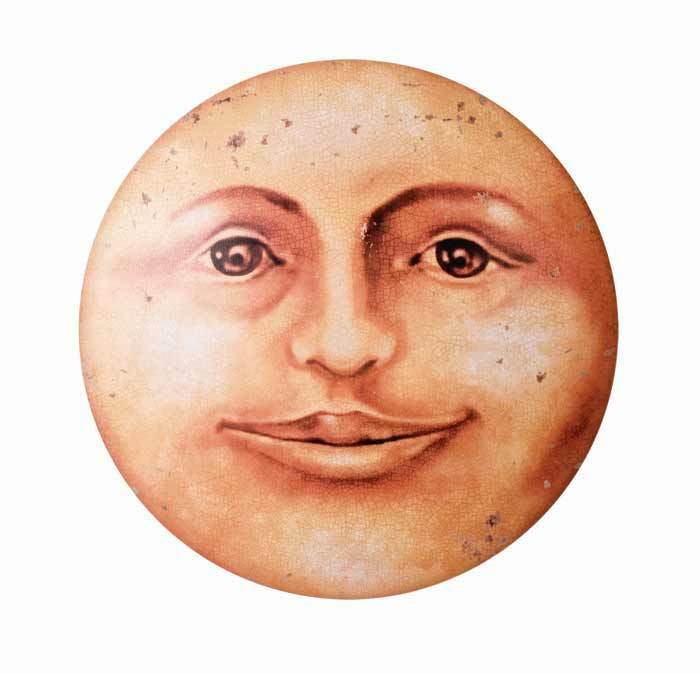 Old Cheesehead-- Folk lore proposed that the moon was a chunk of swiss cheese presumably because of the craters that resembled the aged dairy food. listening to Mannheim Steamroller's HALLOWEEN. 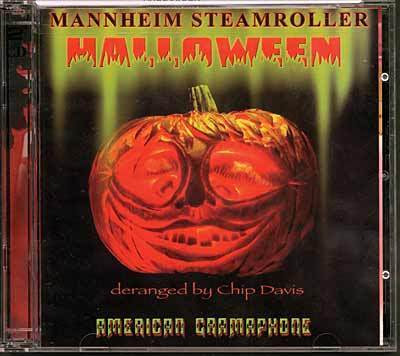 I love Chip Davis and Mannheim Steamroller and had no idea he had a Halloween CD. Where have I been?! What fun! I've been thinking about Spiced Tea. It's just about time, don't you think? and spiced tea sounds good to me. Do you have a recipe for spice tea? I was looking for mine (with Tang ... do they still make Tang?!) and couldn't find it. So, I googled on Spice Tea and the first recipe that came up was from the Hillbilly Housewife! Get out a large dry bowl. Measure the sugar into the bowl. Open up the kool-aid packets and add them to the sugar. 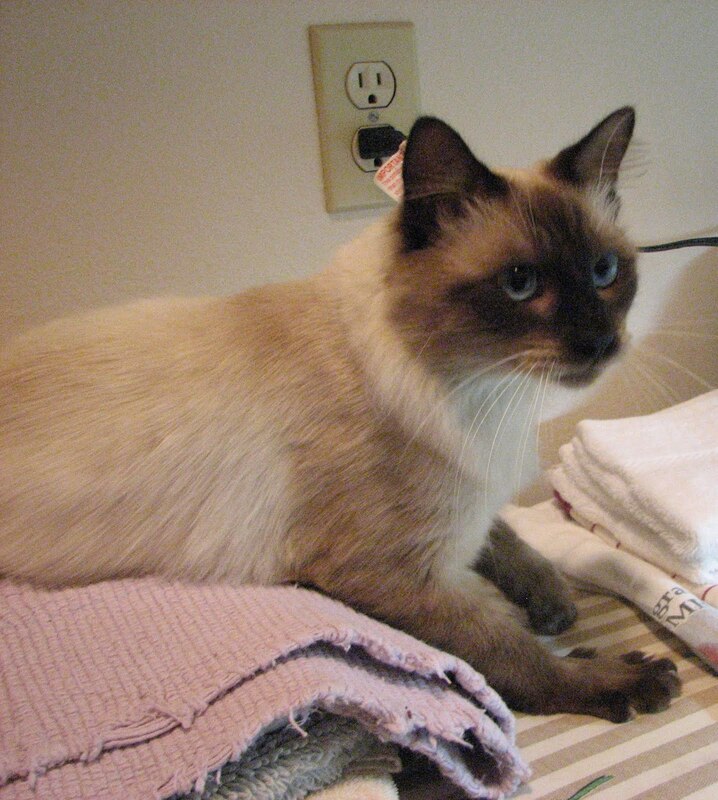 Stir well with a wire whisk or a clean dry fork. Add the instant tea, cinnamon and cloves. Stir again to mix well. This makes about 4 3/4 cups of mix. Store it in a well sealed container. To Prepare: Combine a tablespoon of Spiced Tea Mix with hot water in a cup or mug. Stir to dissolve. Serve hot. Be sure to use the small fruit flavored soft drink (kool-aid) packets, the ones without any sugar added. I buy an off brand at 10 for a dollar. The name brand ones are about a quarter each. Regular recipes for Russian, or Spiced tea usually call for lemonade mix and Tang. I developed this recipe using the same flavors, but without the higher priced, sugar added, mixes. Use your own sugar, and save a bundle. This mix may be packaged in small plastic bags and given out as a gift at Christmas. Be sure to include instructions on how to prepare it. Note: I prepare this recipe with 4 cups of sugar and 2 packets of lemonade mix which makes it very sweet. When I make a cup of it for myself I add a large dash of bottled lemon juice for flavor and tang. The rest of my family prefers the tea plain and sweet. I note this for reasons other lemon lovers will understand, especially if they have been subjected to over sweetened lemon concoctions as often as I. The extra dash of lemon juice gives this beverage just the right amount of “pucker”. It tastes especially good on a sore throat. Combine all ingredients until well blended. Store mix in an airtight container. To make 1 cup of spiced tea: Place 2 teaspoons tea mix in a cup, add boiling water, stir and enjoy! Makes 64 servings or 3 1/2 cups mix. I'd love to know if you have a recipe for spice tea! 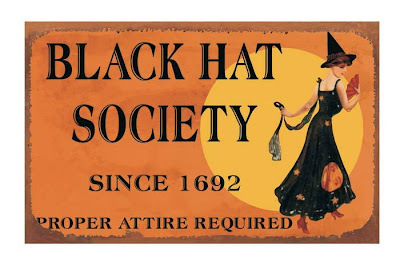 There are so many tea parties on Tuesday and not enough time! Teacup Tuesday is hosted by Martha and Terri. There are four major tea types - black, oolong, green and white. 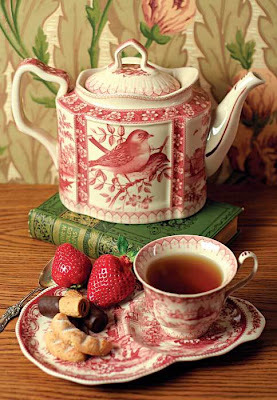 Wishing you well, a JOY filled day, and a wonderful cup of tea! It's the last Mosaic Monday before Halloween so I decided to take another walk around the neighborhood, camera around my neck. 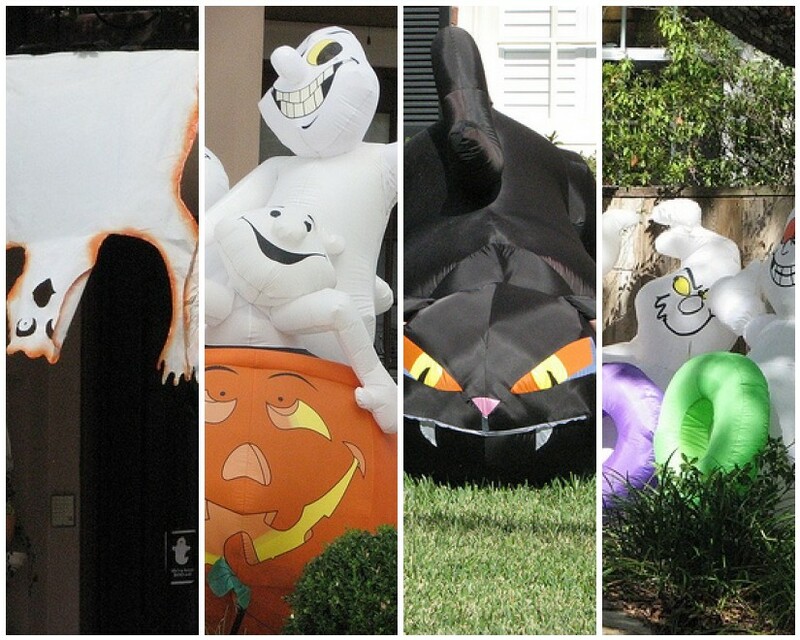 and the wonderful ghostie ghoulie in the tree! 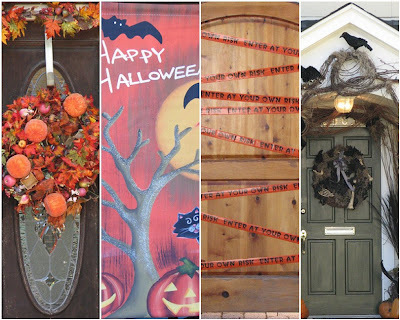 and I thought the hanging ghosts over the door were very clever. But I think the ghosts win! each different and each with its own story to tell. 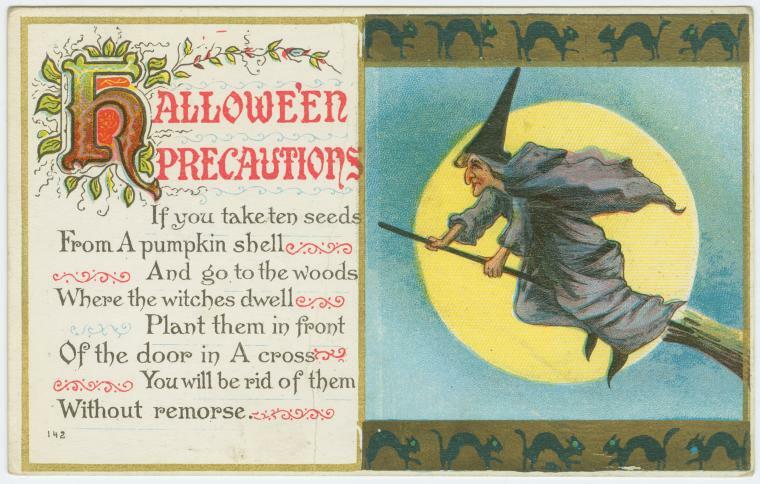 Here is another Halloween postcard from the New York Public Library digital collection. 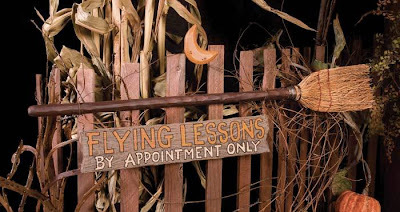 This one is about precautions to take on Halloween. beautiful, old, new, comic, serious, travel. A little fun in a short amount of time. 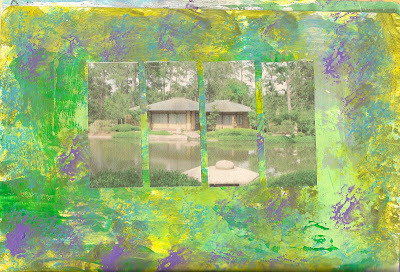 I took an unfinished page from my journal. 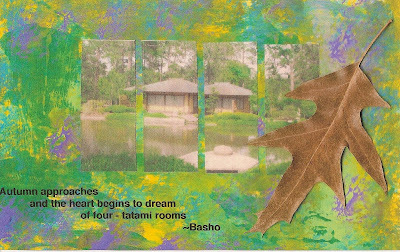 Added a Haiku by Basho. - We are back to summer here. High humidity and temps in the 90's. - I am going to the museum today. It has been a very long time since I've been there. Having lunch with a museum friend and I'll see the new China Gallery. Perhaps pick up a research assignment for the Japanese Gallery ... the last to be added. 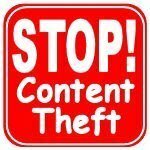 - Mr. Dragon has taken some steps backward. We try to laugh as much as we can! Zoo Confidential. Three episodes were filmed here. The second one was last night. I've enjoyed each one. One of my favorite keepers was on last night ... Lynn ... primate supervisor along with one of my favorite lemurs ... Sifaka. One more episode next week. - Almost forgot! 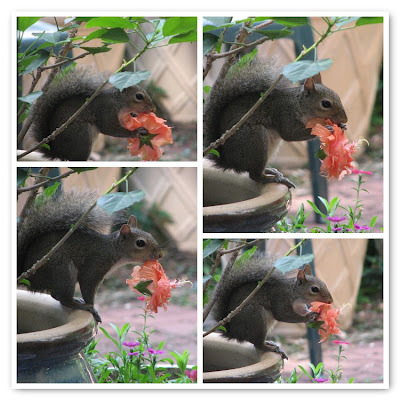 The squirrel family (famous for eating the hibiscus blooms), finished off the tangerines yesterday. Little buggers!!!! The bird food just isn't enough or all the acorns on the ground. Does this mean a *real* winter is coming????? It's that time of year when the post box is full of catalogs. and found some wonderful tea goodies that I thought I'd share with you. I may have to order these. 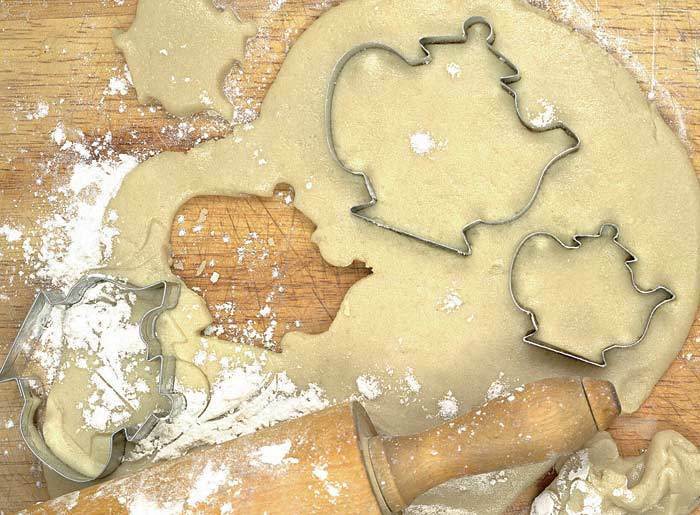 The teapot cookie cutters made me smile! 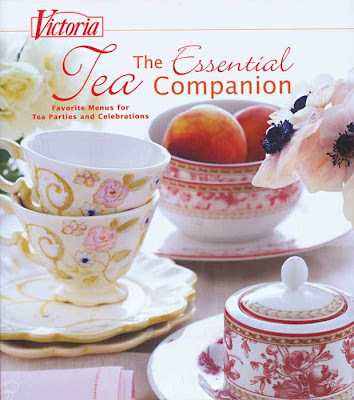 Victoria: The Essential Tea Companion. I think this set was my favorite. Be sure to stop by and see the tea cups on parade! *Keenum is from China and is known as the "burgundy of teas." It is full-bodied with a light taste. Wishing you well, a JOY filled week, and a great cup of tea! There are five Friday's in October. the New York Public Library! 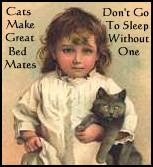 I laughed out loud when I saw this one and I hope you do, too! To look in the mirror and see it's report. 'Come do the dishes now, and don't be absurd.'" the comic to the serious, travel to new places. Enjoy! Wishing you well and have a wonderful weekend! 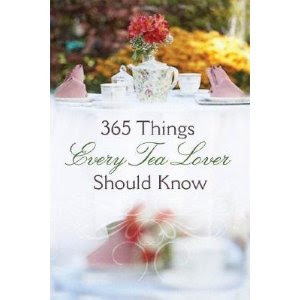 I found this little book: 365 Things Every Tea Lover Should Know. 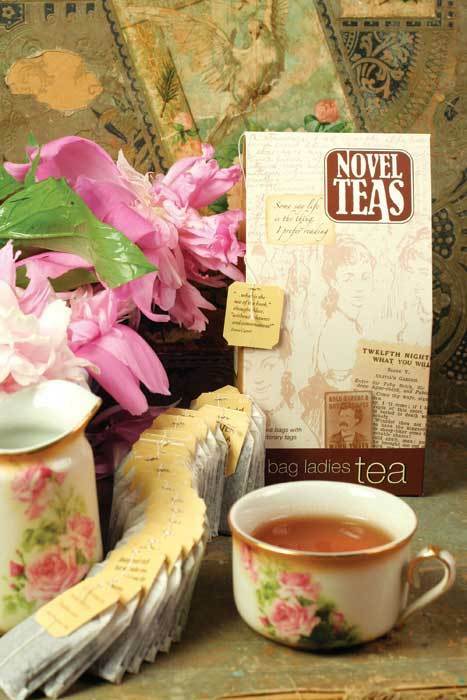 It's just one of many small tea books on the market from Harvest House Publishers. I thought I'd start sharing some of the tidbits from this book every week on my tea post. 1. When making a great pot of tea, pour hot water into the teapot to warm it while the kettle of water is heating. 3. Iced tea was invented at the 1904 St. Louis World's Fair by an expatriate Englishman named Richard Blechynden. His hot tea wasn't selling so he poured it over ice and had an instant success. 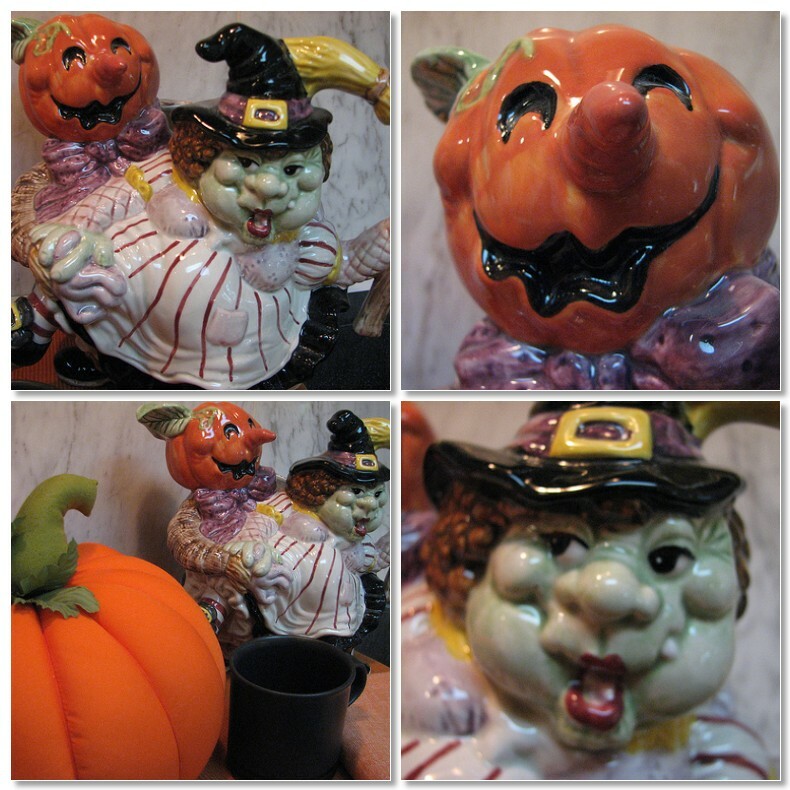 I have some fun teapots and mugs that I like to use when Halloween is on the horizon. The dragon teapot with the wizard. The dragon mugs are from the Texas Renaissance Festival. When we first moved to Texas some 20+ years ago, we went to the Festival every year. Fifty three acres of New Market Village, filled with food, beverages, shops with unique arts and crafts, games of skill and human-powered rides. Octoberfest, 1001 Dreams, Pirate Adventure, All Hallows Eve, Roman Bacchanal, Highland Fling, Barbarian Invasion and a three day Celtic Christmas celebration. Anyone getting into the holiday spirit?!!! 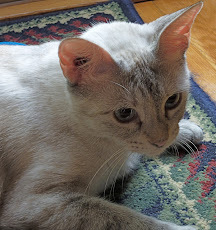 I'm linking to Teacup Tuesday hosted by Martha and Terri! They host such lovely tea parties. Be sure to check out the teacups on parade! 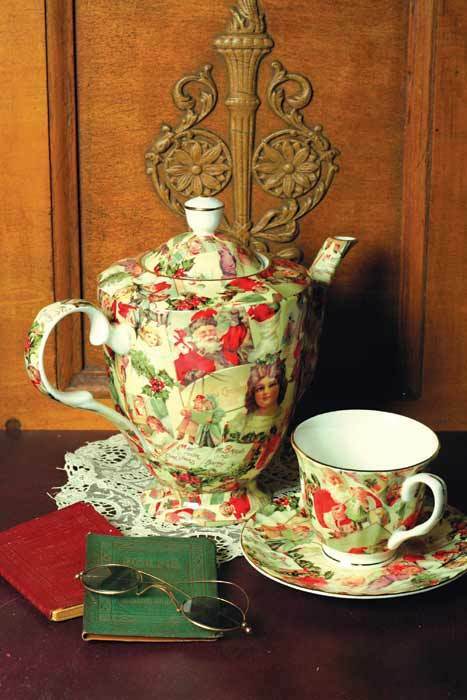 Wishing you well, a great cup of tea, and a JOY filled week! "The path to heaven passes through a teapot." I thought I'd take you on a walk around my block. It's still a wee bit early, but the Halloween decorations are coming out. 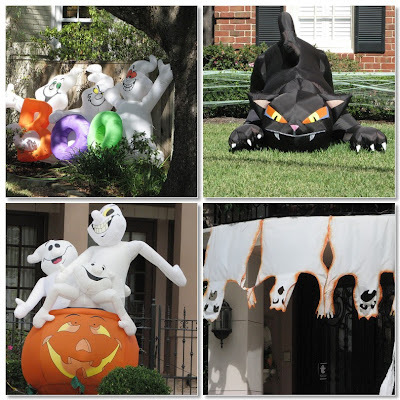 I have a theory about Halloween decorations. pull out all the decorating stops when the Fall arrives. We don't have the wonderful color of the changing of the leaves. 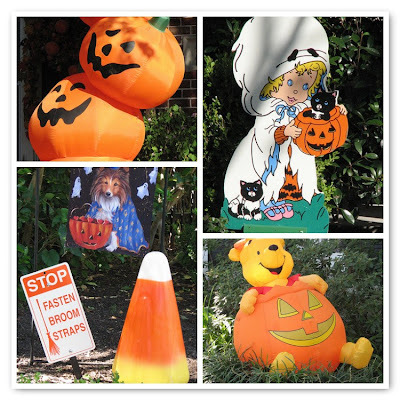 But we can sure decorate starting at Halloween! Each mosaic is different and each has its own story to tell. When I saw this recipe in the October issue of Eating Well, I knew I would try it. Heat 1 teaspoon olive oil in a small nonstick skillet over medium heat. 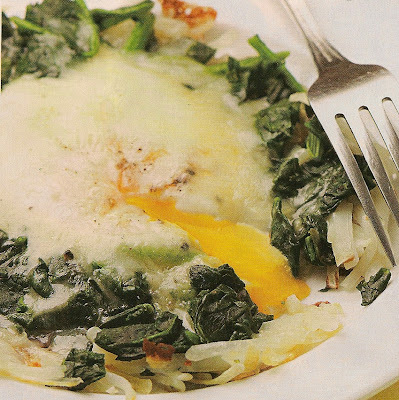 Layer in 1/2 cup each frozen shredded hash browns and frozen chopped spinach (from a bag). Crack 1 large egg on top; sprinkle with a pinch each of salt and pepper and 2 tablespoons shredded sharp cheddar cheese. Cover, reduce heat to medium-low and cook until the hash browns are browned, the egg white is set and the cheese is melted, 4 to 7 minutes. 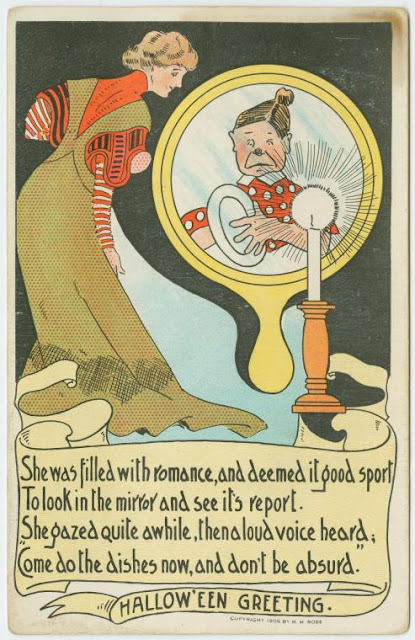 I returned to the New York Public Library for this weeks Postcard. Everyone enjoyed looking in the mirror last week for their true love. and this week it is Hallow'een. This last week we partied with the sea lions at the Houston zoo. Unfortunately, by the time the sea lions came out to entertain us, it was too dark to take photos! It was a beautiful evening, not too hot, and the zoo was lovely in the late evening light. The blue tablecloths made it seem more *sea* like! Zoo keepers brought out some of the smaller animals to visit with us. The top images are two different lesser hedgehogs -- tenrecs from Madagascar. The spiny coat is used to deter predators and is vibrated for communication with other tenrecs. When threatened, the lesser tenrec will roll into a ball, hiss and grind its teeth. Lesser hedgehog tenrecs are one of 30 species of tenrec found on the island of Madagascar. These small mammals are adapted to fill the role of mice, hedgehogs, shrews and opossums found in other parts of the world. This species is found living both on land and in trees and is nocturnal - spending its days sleeping and its night foraging for food. Although tenrecs have lived on Madagascar for some 60 million years,it is possible that some will not survive more than a few decades more. Habitat loss is the greatest threat to this and other tenrec species. 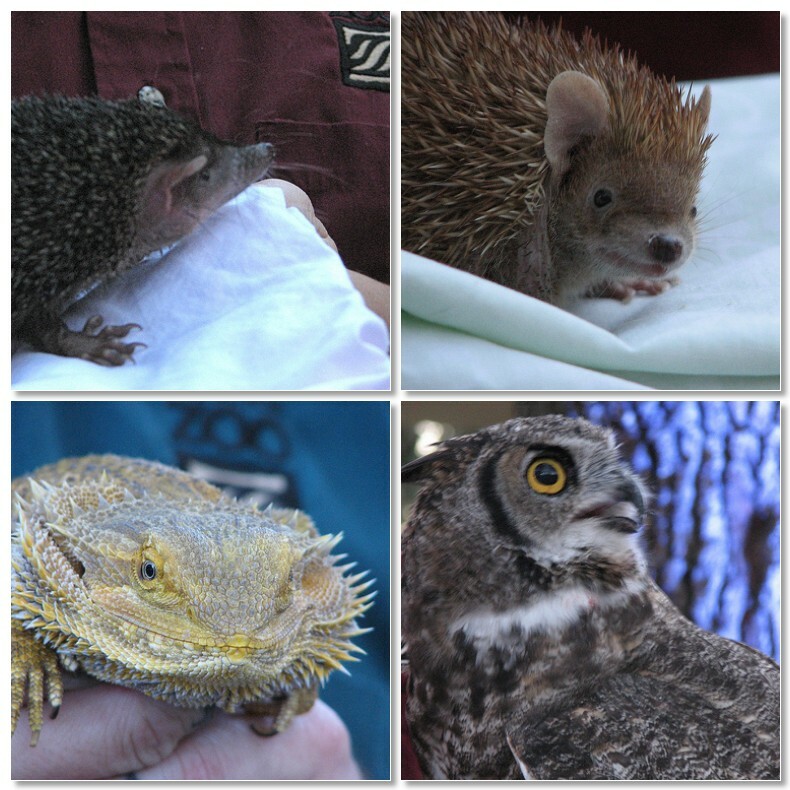 The bottom images: bearded dragon lizard and owl. The owl was very nervous. The grackles were *grackling* and she didn't like them one bit. We learned more about animals in the care of the zoo. The wine and beer flowed. The sea lions put on a fun show. October arrives bringing cool weather and Halloween. I visited the New York Public Library for this postcard. 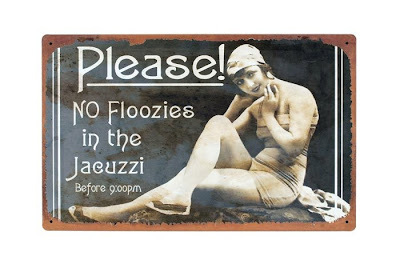 On your visit you'll see a variety of postcards: funny, serious, old and new. Wishing you well and a JOY filled weekend!